In my last post, I wrote about Pittsburgh being a bit recession proof, the great coffee scene AND now we can buy satsumas – holy crap! Do you guys know about satsumas or have ever tried one? 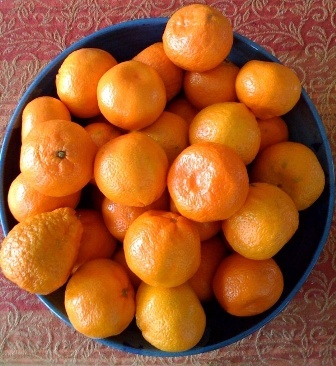 Satsumas look exactly like Clementines but of a different variety. The satsuma is from the mandarin orange family. The fruit is originally from China, but was introduced to the West from Japan. I think satsumas can now grow in California and parts of the southwest? My only experiences of satsumas have been in some of my favorite places – Pike Place Market in Seattle, the Olympia Market and the farmer’s markets in San Francisco from about November to Jan/Feb. Every Saturday morning I shop at the Farmer’s Market in East Liberty. This week, Tim from Kistaco Farms sourced a few boxes of satsumas. I couldn’t believe it and bought 3 of the 4 boxes. I love any type of citrus fruit -but I really love satsumas. They are sweet and succulent with great acidity. Hmm, the description reminds me of a certain espresso served at Tazza D’Oro! Want to try one? I am happy to share my great satsuma fortune with you – and an espresso. Pittsburgh’s a beautiful city, becoming very bike friendly, has the beginnings of a great coffee scene and now, satsumas. Gee, I may run out of reasons to visit the Northwest – NOT! But, having a little Northwestness here makes me very happy. I love satsumas! I used to grow them in New Orleans. Yes, they grow in southern California, but Louisiana satsumas are the best--much sweeter and more of that distinctive, almost spicy, satsuma flavor. Thanks for letting me know where I can find them locally! Culinary hint: If the satsumas are organic, peel the zest, dry, and keep in a jar for cooking throughout the year. The flavor of satsuma zest is closer to tangerine than orange. I use it in lamb dishes and it's one of the ingredients in my homemade Moroccan spice blend. I love satsumas as well but they do not travel well. My brother, Paul, grows them at his home In St. Petersburg, Florida. He always has a bountiful crop.